Let me say a big thank you to Vosges Haut Chocolate for ignoring the fact that I rank rather high up on the Naughty List, and for treating me to an early Christmas present by sending me this collection of holiday-inspired truffles. And keeping with the Goodfellas theme, Ceylon cinnamon is basically the Godfather of the cinnamon world. All other cinnamon-type products, while still members of the family, are various levels of underbosses, capos, and plain old soldiers. 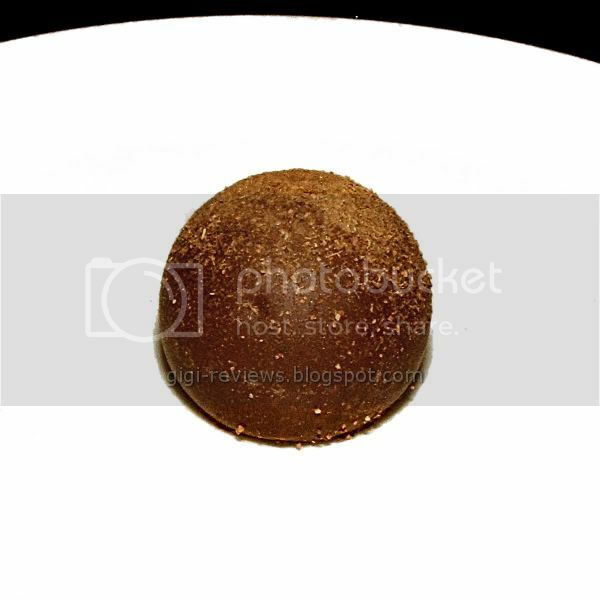 The cinnamon is sprinkled generously atop the 45% deep milk chocolate shell. Inside is the mascarpone. 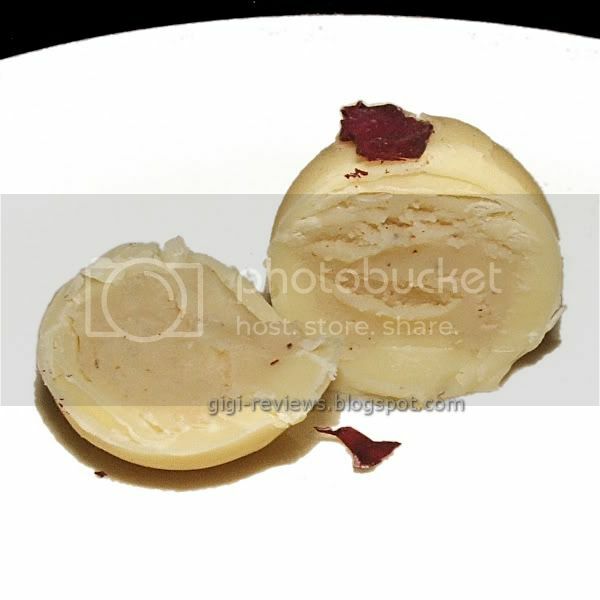 This truffle also contains organic sour cream. Giving the truffle a sniff from the top, it's the deep woodsy spice of the cinnamon that you notice. Once you get into the center of the truffle (normally I would just bite and dig in, but for the sake of pretty pictures we sliced the truffles first), what immediately stands out is the rich dairy smell of the cheese. When I bit into this truffle, for a split second I swear all I saw was blinding white light and unicorns! There might have been a rainbow or two, and Barry Manilow was in the background singing a soaring crescendo. Yeah, this truffle is just that good. You start with a little heat from the cinnamon on top, then when you break through the deep milk chocolate shell, the cool silky filling flows into your mouth. It's sort of like an extra creamy chocolate mousse, mixed with a healthy dose of my beloved mascarpone cheese. The deep milk chocolate was the perfect choice. It's creamy enough that it didn't get lost in the strong dairy of the cheese, and yet not dark enough that it was bitter or upstaged the cinnamon. If I didn't know the sour cream was in there I wouldn't have noticed it -- but you know what? I don't care! 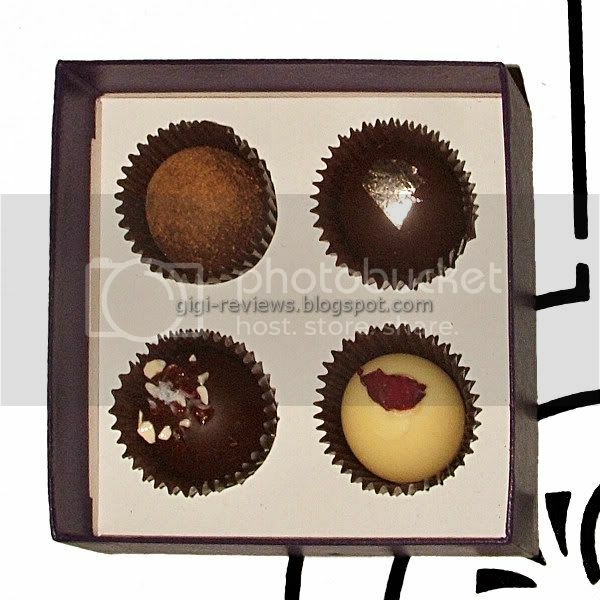 If you only try one Vosges truffle in your lifetime, make it this one! I don't have much base of reference for plum pudding. About all I really know is that the Cratchits (the family from Dicken's "A Christmas Carol") seemed to think it would not be Christmas without it. Oh, and that the traditional version is a type of steamed pudding made with different dried fruits, liquors, nuts, and is often topped with hard sauce. But I can't say I've actually had one. 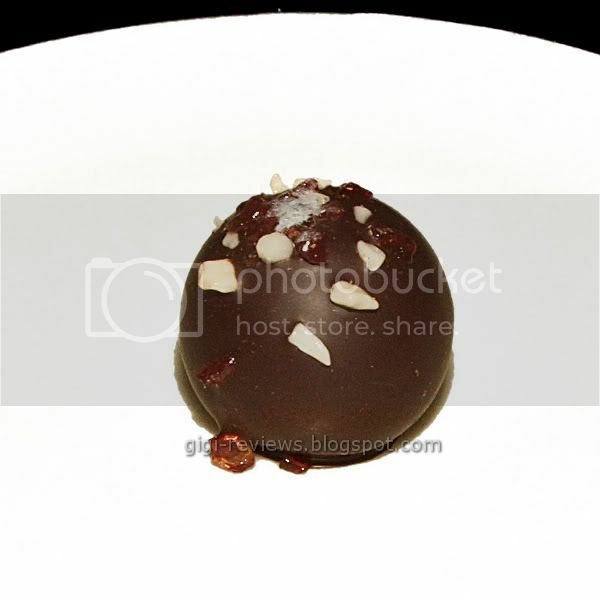 The Vosges version contains plums, Armagnac (a type of brandy), and marzipan, and is covered with 65% dark chocolate. 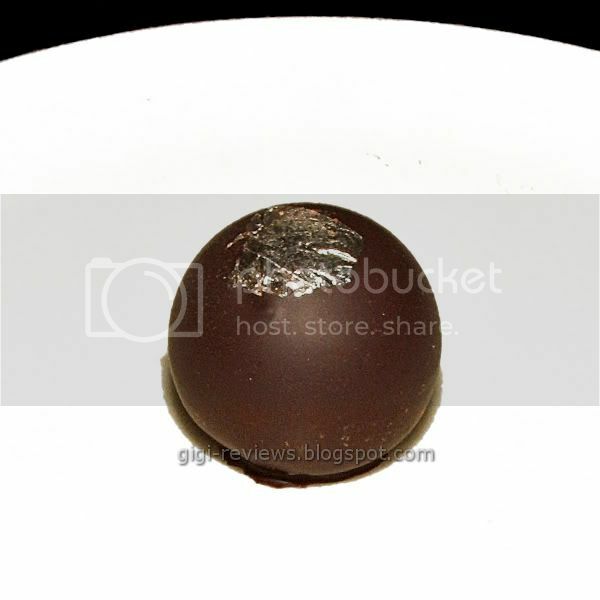 The truffle is topped with a pretty little piece of edible silver foil. What made this one stand out was the texture. The center, rather than being completely smooth, is layered. The top portion of the filling is the same silky creme as the others. Then right below that is a layer of what looks like finely chopped plums, and on the bottom of that is the grainy marzipan layer. I loved the overall flavor. It was lightly boozy, and the plums were plump and sweet. 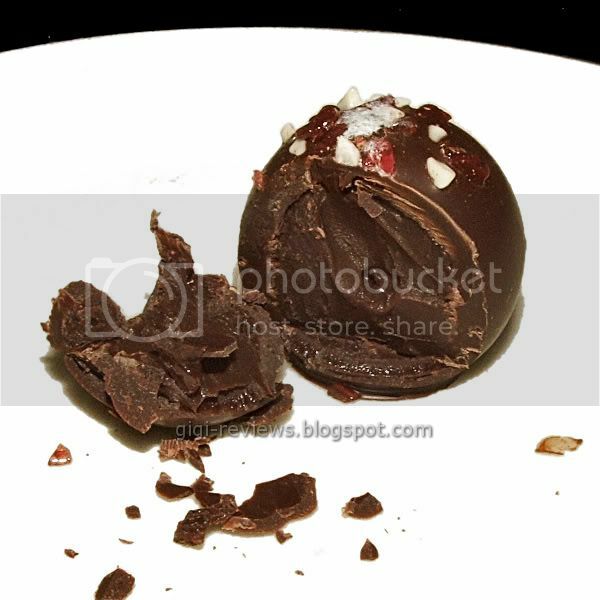 The dark chocolate takes the edge off of the sweetness and melts nicely. 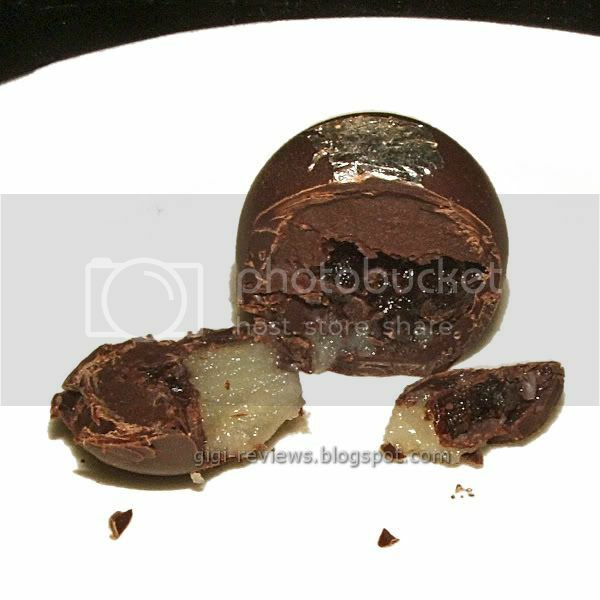 I hate to say that what ruined this truffle for me actually was my beloved marzipan. Mind you, the flavor of the marzipan was good: almonds with mild cherry notes. It was the texture I didn't like. It was like a very loose, grainy fondant. Had it been smoother or firmer, I would have really loved it as is...did I mention that the plums were really sweet? It's hard to get more simple than all natural candy cane pieces, peppermint, and 65% dark chocolate. And simplicity is often a virtue. I liked the fact that the top is where the crunchy bits of candy live. It gives a little contrast in texture, and the red bits look like shards of stained glass. 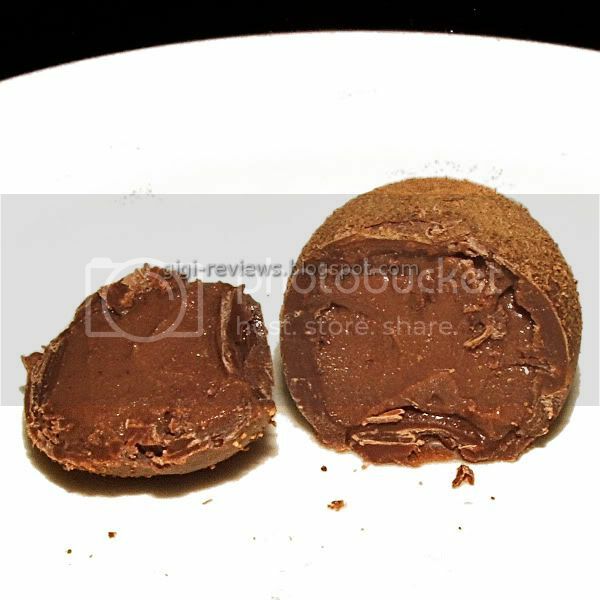 The outer 65% dark chocolate shell is a really deep woodsy, earthy chocolate. There's some coffee flavor. On its own it would be a bit too bitter for me -- but paired with the sweetness of the smooth mint center, it's perfect. The center is very cool on the tongue and the texture is almost like pudding. The chocolate is so smooth and rich I could practically drink it. The peppermint is brisk. It's very natural, not mediciny or artificial. Overall it worked beautifully. WOOHOO! Eggnog! Eggnog with RUM! As I have said before, in honor of my best friend who is from St. Croix, I am partial to Cruzan rum. But Vosges didn't get that memo and instead they opted to use Appleton Estate rum. Appleton has been distilling rum since 1749 and is the oldest distillery in Jamaica -- so it's safe to say that they know a thing or two about making rum. 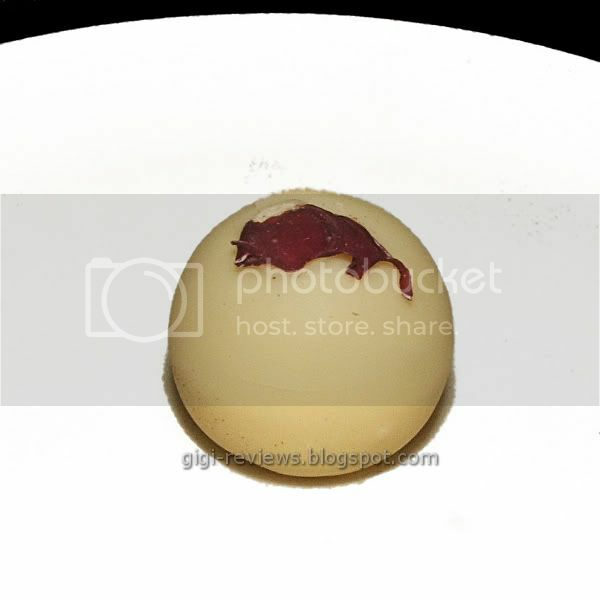 The truffle also contains nutmeg and ginger, and it is all wrapped up in white chocolate from the Dominican Republic. Overall, even with the couple of (minor) qualities I didn't care for, this remains a truly stellar collection. The Mascarpone/Ceylon Cinnamon Snap alone is so good that no matter how the other three flavors had turned out, I still would have been happy. Let me remind those of you who are still shopping for the perfect gift for the old friends and loved one (or for yourself) that Vosges Haut Chocolate is offering my readers 10% off orders placed by December 31st. Just be sure to use the special code BLGF09 when checking out. These look pretty fantastic, almost like truffles that should be eaten with a knife and fork. It's too bad they don't have any retail outlets in my area, because the shipping is killer especially to have it by Christmas. Chocri Custom Bar: "Gigi's Dream Lemon Bar"
Winner!! Campbell's V8 V-Fusion Giveaway!